So here it is. One day before official release day. InFinite, the vinyl edition. Reported to play at 45 rpm – presumably to achieve best possible sound quality from the vinyl – the tracks are spread out over all four sides. This copy spins somewhere in Denmark and was delivered by the mailman today. Have you also received yours? And how does it sound, feel and taste? Let us know! With thanks to Morten Overgaard. Posted by Rasmus Heide on Thursday, April 6th, 2017, filed under News. You can follow comment on this post through the RSS 2.0 feed. You can skip to the end and leave a comment. Pinging is currently not allowed. Stax of wax & the platters that matter…. now take ’em for a spin & enjoy!. I bought the CD/DVD a few hours ago. It is a magnificent beast & I love it. The Surprising… Birds Of Prey…. OMG! 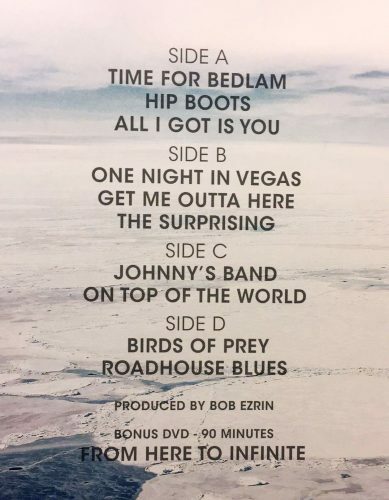 All of these tracks rock, I don’t want to believe that this might be the last album, because it feels as though they’ve just taken much of their song writing up a couple of levels. There just has to be more like this within them yet to be let out. 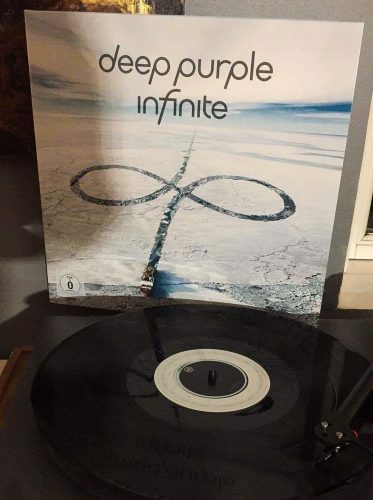 I am pleased to add Infinite to my collection & I thank our mates in Deep Purple from the very depths of my consciousness & heart. Viva La Deep Purple!. You guys rock. Be happy & smiles to ya all!. The mailman delivered the big box edition about two hour ago.Now Im finished with the first round of listening. Enjoyed the music through and through. Congratulations, gentlemen. Everything about the box has “high quality” in capitol letters written over it. The vinyl is extremely heavy, as is the cardboard of the sleeve. The special photo prints are also on very thick cardboard und printed very glossy and saturated. The “now what live tapes” with their three different landscapes through which the “infinite logo river” runs have matching colored vinyls. Even the t-shirt has a decent quality of cloth. The sound of the records is great, very much in the same line as “now what”, perhaps even slightly improved. But that is about the sound as it was recorded. I did not have the time yet to compare the vinyl sound to the cd so I cannot tell you yet if there`s any difference between the two. I`m not a vinyl purist anyway, in my opinion some cd’s sound better and in some cases the records sound better, so I leave that subject to others. 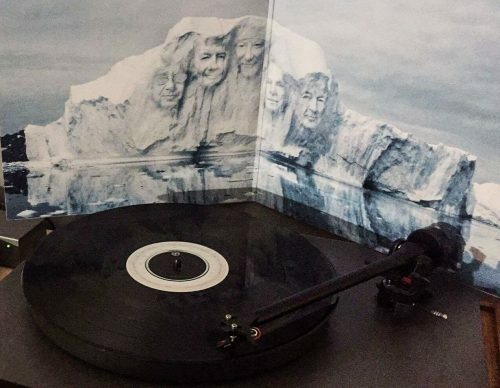 All I can say is that the records sound absolutely great, the music is a joy to listen to and that the overall appearance of the box set is really cool and a lot of fun to have. I hope you all enjoy the release, too, whatever format you chose. Damn, I ordered the BIG BOX from Amazon because of the lack of good brick and mortar Record Stores around my house (except for the punk rock Vinyl Solution but not really up their alley) and it is not supposed to get to me until the 14th give or take. They say that “they” will not even have it available here in the States until the 13th but I hope that they are wrong about that and they get it earlier. I CAN”T WAIT!!!!!!!! Black Night might be from Limitless, or both lives may be exclusive. I just received the double vinyl and DVD. Very confused at first until I realised it’s supposed to spin at 45rpm. The music is the best since RB left without a doubt – but the vinyl mastering is terrible …it’s been recorded digitally, but not mastered properly for vinyl, which is a real shame as the production seems great. Anyone else noticed this? Do I have to go out buy the CD too to compare it? What do you mean exactly by not properly mastered? I am still waiting for mine (hopefully still today) so I have not listened to it yet but the few reviews of the vinyl that I have seen don’t mention anything about the mastering, just a rocking record!